It is a fine example of a local history museum, well housed in premises attached to the Hunters Hill Town Hall, with objects displayed mainly in glass cabinets. The archives section is unfortunately very small, comprising shelving and steel filing cabinets. Files are kept in archive boxes, on book shelves and in the standard office type filing cabinets. The collection (material objects and ephemera) reflects aspects of local community life and environment. Hunters Hill, sometimes referred to as the "French Village", is a garden suburb of Sydney, where Lane Cove and Parramatta Rivers form a significant part of the natural environment. The built environment, is predominantly made up of single family dwellings. A significant number of these are sandstone buildings from the second half of the 19th century showing the influence of the French developers of that time and the Italian stonemasons and builders who worked and lived in the area. Wheelchair access, guided tours, archives, information service, publications for sale, guided tours can be arranged. Approximately 400 items, 200 photographs, 50 books. The collection reflects the social and pictorial history of Hunters hill. Objects include furniture, decorative items, domestic effects, clothing and accessories. Pictorial history is mainly in the form of photographs, paintings and maps. There are council records, lands directories and reference books, files. The collection comprises furniture, decorative items, domestic effects, clothing, accessories, few local club trophies and memorabilia in the form of medals, children's games, family Bible's and sewing implements. All such items are locally sourced, most having been given to the museum and some being on loan. None have been bought. The museum also has an extensive pictorial collection, mainly in the form of photographs (houses and people) paintings, maps, Sands Directories, files on families, houses, streets, etc., and reference books on local history. There is a series of 16ml films on Hunters Hill and a small collection of oral histories recorded with old time residents. 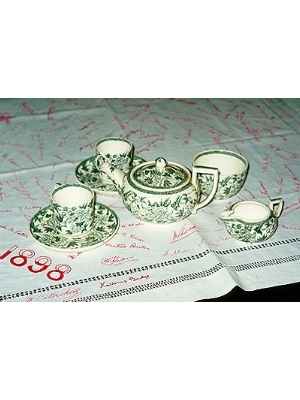 2 coffee cups and saucers, teapot, sugar and cream comprising a part only of a tea/coffee service. Donated by the estate of Gladys Crosby of Hunters Hill in the late 1960's. The tablecloth in the background is made up of embroided signatures of many Hunters Hill identities. 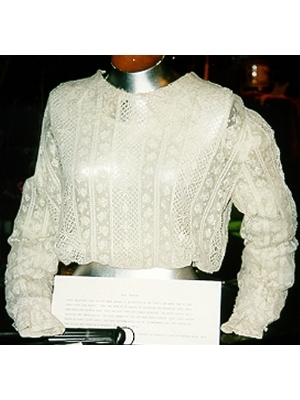 Made up of hand sewn panels of white Victorian and Edwardian lace, both hand and machine made and edged in fine tatting. The wide lace panels are hand made Torchan Lace (also called Bobin or Cluny lace). The smaller 'Rose' pattern panels are made of Valencienne Lace. Belonged to Gwyneth Falson of Hunters Hill. 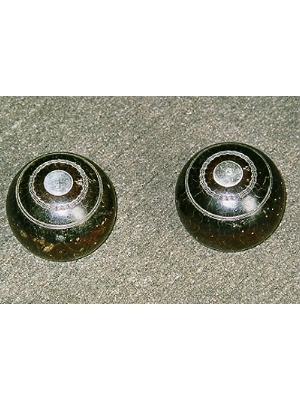 Pair of wooden lawn bowls with stirling silver inserts inscribed "presented to H.W. Meggit esq. 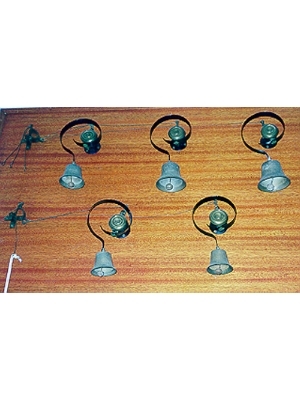 By the PBC"
Timber board mounted with five brass bells. "Loombah" is a 19th C stone house in Stanley Road, Hunters Hill. It is an aboriginal word meaning 'steep banks', which is very appropriate for this house siting high above Parramatta River on the Hunters Hill Peninsula. 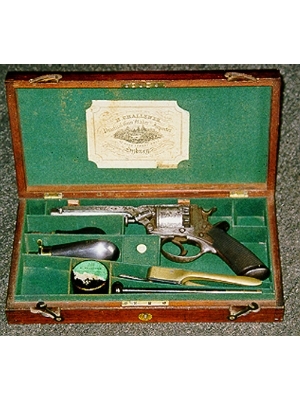 45 calibre, 6.5 "barrel; 5 shot with pivoting ejector rod; in original timber case with accessories. This gun is reported to have belonged to Ambrose Foss, an early resident of Hunters Hill, who arrived in Australia in 1827 and died in the 1860's.